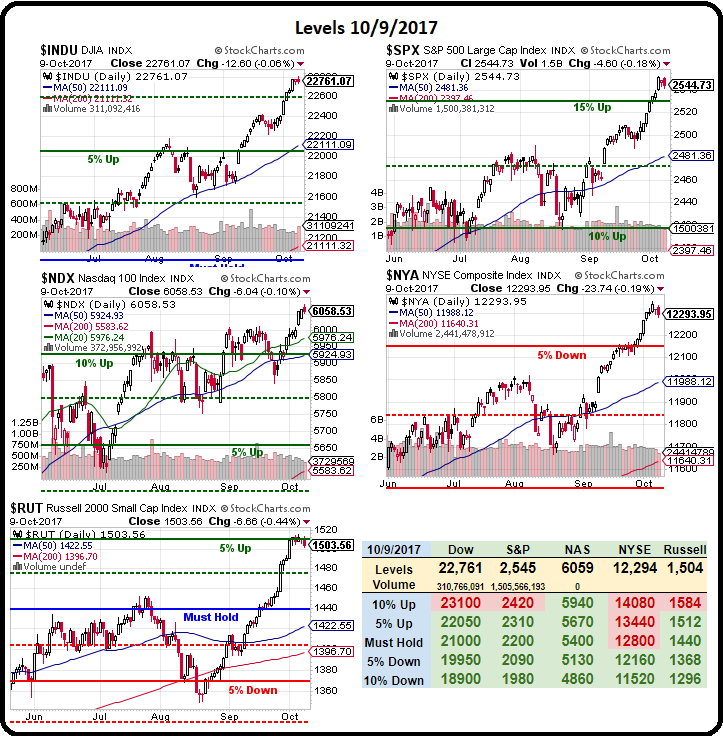 Wonderful Wednesday – Dow 23,000 or Bust! On the right is the Daily Guidance Oscillator, which shows how forward guidance is fading fast, unraveling the enthusiasm of August with only 28% of companies reporting issuing positive guidance and a whopping 39.4% going negative and the chart you see is the net trend difference between postive and negative guidance. The trend was this bad in July and the markets took a very small dip (2.5%) and in March it was worse and we dipped about 5% but we're up 10% from the March lows now and up 15% for the year so we'll stay on our toes and keep an eye on this indicator as more earnings reports come in. 80 of the S&P 500 report next week and another 240 next week so it's definitely crunch time. Another indicator we're watching closely is the Advance/Decline lines as we're seeing the game we discussed yesterday playing out where major index weights, like Apple (AAPL) are being used to prop up the indexes while the Fund Managers and Banksters sell off the bulk of their holdings. The reason they do this is because holding up the index keeps the ETF money flowing in (from 401Ks, IRAs, etc. ), which creates plenty of buyers for their small positions while they spend their money accumulating stocks they don't mind holding through a correction – like AAPL. 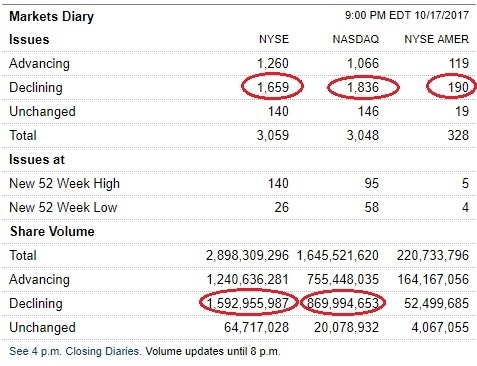 Notice that the number of stocks that were being sold and the volume of selling far outweighed the buying yesterday and also notice the most of our market gains come in the early morning Futures – where trading is very thin. That's another Fund Manager trick – jack up the futures and the retail suckers rush in to chase the move while you sell off your holdings into higher volume. Jim Cramer had a nice video explaining how fund managers manipulate the market, noting it doesn't take much money to manipulate the markets using the Futures noting "It's a fun game, and it's a lucrative game" and "I would encourage anyone who is in the hedge fund game to do it because it's legal and a quick way to make money – and very satisfying." http://welcome.philstockworld.com/wp-content/uploads/2015/09/PSW-Adooma-logo.png 0 0 Phil http://welcome.philstockworld.com/wp-content/uploads/2015/09/PSW-Adooma-logo.png Phil2017-10-18 12:35:392017-10-18 12:35:39Wonderful Wednesday – Dow 23,000 or Bust! Well, it never left but it paused for a day and that's something, right? As is often the case when the markets need a lift, Apple (AAPL) is getting a boost and, since it's in the Dow, the $10 run this month has added 85 of the Dow's 1,000 points but, in the S&P 500, AAPL is a whopping 4% of the S&P 500's weight so the 6.66% run from $150 to $160 adds 0.25% to the S&P, which is up 100 points (4%) over that time. In the Nasdaq, fuggedaboutit, as AAPL is closing in on 15% of the Nasdaq's total weight so adding 1% to the index all by itself from that run while the entire index is up 4% so 25% of the move comes from AAPL and probably another 25% from AAPL suppliers! Boosting some of the key components in an index through upgrades, M&A rumors or straight-up buying of the stocks is a great way to mask selling by Fund Managers and Banksters when they don't want to scare off the Retail Investors while they move to CASH!!! (have I mentioned how much I love CASH!!! lately?). Yesterday, for example, the Nasdaq finished up but 1,514 stocks declined while only 1,370 advanced in the index. A falling Advance/Decline Line is one of the things we watch for if there's going to be a correction, so we'll be keeping an eye on it during earnings but nothing to worry about… yet. Meanwhile, it's earnings season and yesterday we got a beat from Schwab (SCHW) and SONC (SONC) although the latter blamed the hurricanes for any shortfalls. KMG (KMG) and Netflix (NFLX) missed but Netflix was immediately forgiven by rabid fans, who are happily paying the 10% rate hike which will, hopefully, compensate for their profligate spending. NFLX did add 4.5M new subscribers and, at $13/month, that's $702M/yr in new revenues added in just one quarter – not bad! Unfortunately, they have also increased content spending by $1Bn/yr ($8Bn now) – so we'll see how things go for them but the bottom line is they burned $465M in cash last Q – not good. Well not today, it was the 19th but that's the closest Monday. Anyway, it was a Monday (a day like any other day) when the Dow fell 22.6% in a single day. That was only 508 points at the time (what inflation?) and it dropped to from 2,246 to 1,738. That happened pretty close to the anniversary of the original Black Monday of October 28th, 1929, which kicked off the great market crash and the Great Depression. We may be too bearish into the weekend now so we'll have to play an upside hedge (in addition to RSX, which has also popped since our pick) and we'll look for something during today's Live Member Chat Room. Today's run-up may be nothing but we're breaking over technical levels that certainly LOOK bullish enough – especially on the Russell, where we've been shorting. This morning's rally is based on Chinese Import Data, which is up 19% from last year, which sounds very impressive until you realize that the Dollar was 10% higher vs the Renimbi last year, so half of that growth is currency-related – assuming the data is accurate in the first place – which is always a question with Chinese data. That's net $1,725 on the $7,500 spread so the upside potential is $5,775 (334%) if VALE is up 20% by Jan, 2019. The downside risk is owning 1,000 shares of VALE at $10 plus the potential loss of $1,725 so net $11.75 makes this an aggressive play but anything over $10 means we do not get assigned the short puts and we're already $4,500 in the money to start the trade – that's fun! What can we do now to boost the markets. We got the Fed minutes yesterday afternoon and there were no new revelations there to justify another 18 consecutive days of new highs. Sure it's being spun that way but that's the same way these depraved Financial Networks spin every rally – at the behest of their mainly-broker sponsors. Not that the financial press is any better – even as an independent who makes his money selling subscriptions, rather than ads, I still find that we get far less subscribers when we are cautious or negative on the market than positive so, even if you think the Networks are not being specifically paid to mislead you – you can be sure they are doing it for the ratings! The closer you get to a bubble top, the harder it is to get fresh money off the sidelines and the harder the market cheerleaders have to cheer to get you to put your money into the positions the sponsors are trying to wriggle out of. Meanwhile, the sponsors play their own games – sending their analysts out to upgrade key stocks that boost the sectors they are trying to unwind. As we pointed out yesterday – that's why you see all these upgrades on Tesla – the same week Musk is accused of fraudulent forecasting. That's NOT going away – but their profits are! Which Way Wednesday – Are the Markets Now Too Big to Fail? This morning the Nikkei is back to its 20-year high of 20,900 but still far shy of the all-time high of 39,000 – hit way back in 1989. We'll forget ancient history and focus on the current move, which is now up 5,000 points since the summer of 2016 – just barely over a year ago. There's nothing too strange about that, the other Global markets have similar gains and Japan's Corporate Profits are up 23% over the same period – so 2/3 of the move may even be justified. That's net $5,000 on the $10,000 spread that's over $7,000 in the money to start. The upside potential is $5,000 which would be a 100% return on your money and your worst-case downside would be owning 500 shares of EWZ for net $30/share ($15,000). The ordinary margin on the short puts is just $780 so it's a very margin-efficient play as well. http://welcome.philstockworld.com/wp-content/uploads/2015/09/PSW-Adooma-logo.png 0 0 Phil http://welcome.philstockworld.com/wp-content/uploads/2015/09/PSW-Adooma-logo.png Phil2017-10-11 11:51:552017-10-11 11:51:55Which Way Wednesday – Are the Markets Now Too Big to Fail? As you can see from our Big Chart, our indexes are up about 5% in the past 6 weeks and, so far, no sign of slowing down despite declining volumes. 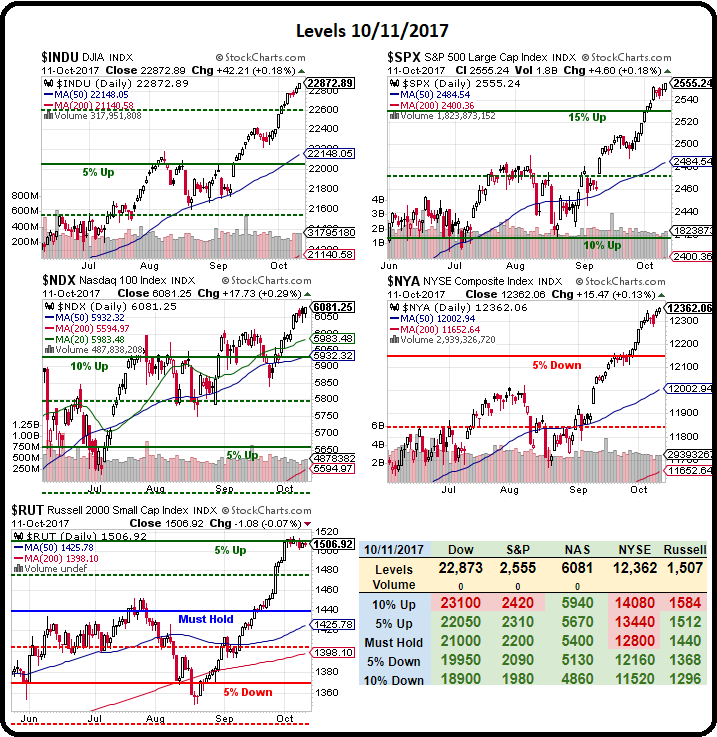 The Russell (small caps) is our leader, with a 10% move in 6 weeks and only the one little pullback in early Sept – before a solid 7.5% move straight up since. As I noted on Thursday, we pressed our Russell (IWM) short positions using the Ultra-Short ETF (TZA) with Nov $12 calls, which were $1.35 at the time and are now $1.45. Per our fabulous 5% Rule™, we expect a 2% (weak) retrace of the 10% run from 1,368 to 1,512, which was 54 points so 11-points back we'll call the 1,500 line and a stronger retrace of 4% would take us back to 1,490 (rounding again). Columbus sailed the ocean blue – and got totally lost, missed India by 6,000 miles but called the Native American Islanders Indians anyway, slaughtered them and stole their gold and, lacking any real wealth to go back to Spain with, instituted a slave trade that lasted 250 years and ruined the lives of tens millions of people. Yay! I got called into the Principal's office when my daughter gave a report like that in 7th grade – just 5 year ago. Suddenly, it's in vogue to question our "heritage" and the legends of the founders and that's a good thing. You want Russians to question Marx and Lennin and you want the Chinese to question Mao so why shouldn't our children question Columbus and Jefferson? Either you want to raise critical thinkers or you don't. "I know for a fact that every single day at the White House, it's a situation of trying to contain him." "You guys know what this represents? Maybe it's the calm before the storm." That's the word from our President last night as he prepared for a dinner meeting with his military commanders. The press asked him WTF he was talking about – as the President has many enemies he'd like to attack from Kim Jong Un to NBC News - who knows which way the drones are going to fly and Trump, ever the consumate game-show host, left us with a cliffhanger saying "You'll find out." Certainly Trump needs a distraction after such a terrible week for his Presidency and he's been working overtime to keep the haters spinning in circles, rolling back environmental regulations, arguing for gerrymandering in the courts, taking away birth control, taking away abortion (the GOP needs more poor babies to vote for them), demanding Congress violate the first amendment while defending the second in the wake of tragedy… Hell, I bet you don't even know the US refused to join the rest of the civilized World in condemning the DEATH PENALTY for LGBT people in other counries. That's right, the US actually voted AGAINST a UN resolution that condemned the death penalty as a punishment for being gay. This is not fake news, this really happend – in America – in 2017. The fact is that we live in a world where even today gay people are being arrested, tortured and killed because of their sexual orientation. And the United States didn't just let an opportunity to condemn those atrocities pass by - it did much worse. It took a stand against that condemnation. The markets just don't go down anymore. 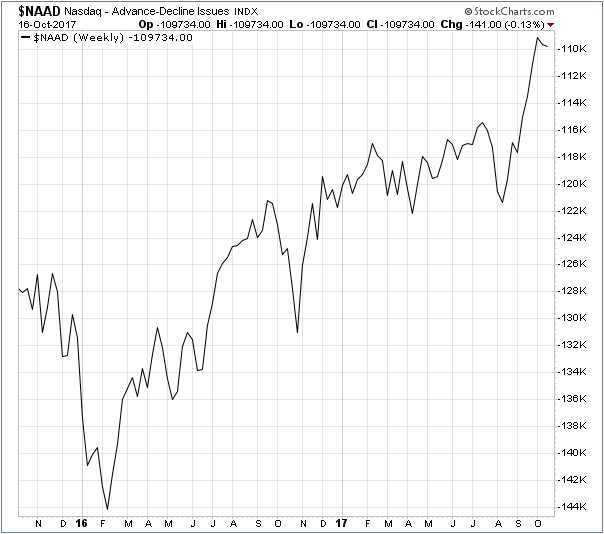 I said the markets were broken the other day and this BAC chart spells that out. We haven't had a sustained move down since last year as the market keeps grinding higher but it's all based on what investors HOPE is going to happen – not what is actually happening. The "Hard Data" has, in fact, been crashing all year and the bounce we are currently celebrating is mainly due to post-hurricane buying – something we knew was going to happen but is still getting the markets very excited and now analyst/cheerleaders are extrapolating this one-time boost in buying ad finitum to entice more money off the sidelines and into the markets. Even Warren Buffett is getting into the act, virtually guaranteeing the tax cuts will pass (which should boost bottom-line earnings – even though no actual improvements in sales or operations will have occured) and going so far as to state that he isn't even selling his winning positions because he will save so much money next year on lower tax rates. Of course Buffett is talking his massive book, which holds hundreds of Billions of Dollars worth of stocks at record highs. So are all the other fund managers they are trotting out on TV – telling you how great the market is at this price. We are VERY reluctantly long still, but not so much. Since our last Portfolio Review in mid-September, our Long-Term Portfolio has gained $48,000 (2.9%) while our hedges in the Short-Term Portfolio have dropped $30,000 so a net gain of $18,000 on our paired portfolios while we're putting in fresh record highs. Just this morning, we discussed, for the first time, buying NAKED LONG TZA Nov $12 calls, which are $1.35 with (TZA) at $13.15 so they have just 0.20 in premium and, if the Russell (now 1,515) does drop 2.5% to 1,477, the ultra-short ETF would gain 7.5% to $14.13 and the calls would be worth $2.13 – up 57% on a 2.5% drop in the Nasdaq so 20:1 leverage on the downside.